hey — Kanye said it himself. Ideas are recycled, and should be recycled. Perhaps that’s what his former creative director Virgil Abloh has done with his first Louis Vuitton sneaker, but it’s definitely what China’s Li-Ning have done with their latest chunky trainer. The Eastern label is fresh from flexing their unique streetwear at the NYFW in 2018, which revealed a rang of vibrant Wave Runner-esque trainers. One pair however, adopts a totally wild color palate, ranign from soft tones to vibrant pops of pink, blue and yellow. The other? well, that’s a little closer to home for Ye’. 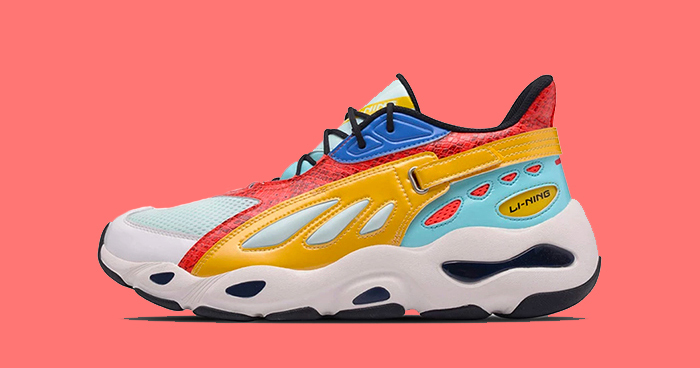 The pairs come constructed in a combo of mesh and suede, with the upper rocking a butterfly wing-inspired design with Li-Ning branding popping up near the heels. It’s velcro tightening system is reminiscent of the Air Jordan 8, enabling you to tighten the reigns if needed. The oversized sole appeals to the wannabe daddys. But, unlike similar kicks, you wont have to have yourself a sugar daddy to afford them. These are currently going for a low $160 on Li-Ning’s Aliexpress page.